Vinegary coleslaw burned my nostrils as I choked down bread. This was the first time I tried the legendary Pittsburgh Primanti's sandwich -- the one with anchovies, of all options -- and I laid face down in it. To clarify, my circumstance was not by choice. Racing in a scavenger hunt, the challenge required all competitors to finish a full, highly stacked ‘wich without the use of hands. I remember tasting nothing and being served water full of my fry-infused backwash. What a day to be alive! The memory of this enormous, handless struggle stayed with me for many years. Three, to be exact. For three years, a chasm existed between me (a non-native) and the rest of Pittsburgh because of this damn sandwich. I held a shrouded secret -- that I didn't like Primanti's -- that if anyone knew, I'd be doomed to transient status forever. That is, until I had a second forced encounter with Primanti’s during a city-wide food tour. I sat with friends and shared another of the restaurant’s staples: the a Pitts-burger, the alleged second-best selling item after Iron City Beer. Nose to sandwich with the thing, I sucked in my own pride, trading it with my civic duty. Humanely consuming the behemoth of Italian bread, coleslaw, fries, cheese, and meat patties, I finally understood what the hype was all about. This was Pittsburgh in a sandwich; each salty-acerbic bite anointing my tongue with residency. I felt like I officially lived here; I had been initiated. Sitting in the midst of Primanti's regulars munching on their own towering sandwiches, I couldn’t help but feel that I, too, belonged. The city’s love affair with the kitchen sink sandwiches started more than 80 years ago. In the 1930s, Joe Primanti peddled sandwiches out of a little wooden cart in the Strip District. One day, he received a potato delivery, and said something to the effect of, "Let's put them on the sandwiches!" And just like that, a star was born. No overtures -- it just suddenly, humbly, existed. 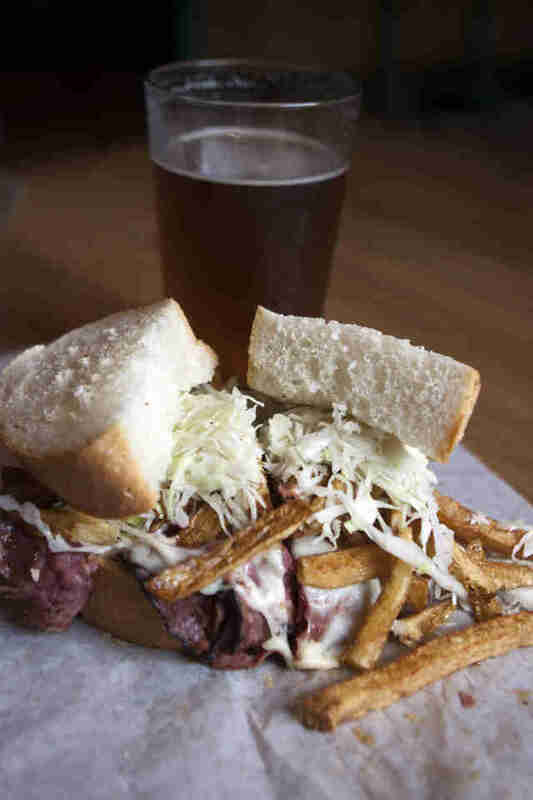 The idea of an all-in-one sandwich of meat, coleslaw, and French fries became an instant hit with the surrounding Strip District purveyors. The original Primanti Bros. Strip District storefront opened in 1933, and became the place for the workingman to grab a cheap, convenient meal. Then came another storefront, and another, and another... Today, there are 30 Primanti storefronts across the country with a loyal public following. 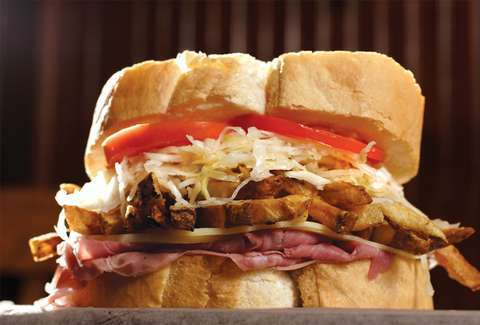 "The Primanti’s sandwich is Pittsburgh," says Amy Smith of Primanti’s marketing. "Everyone has a story of their first sandwich. When people come to town, Primanti Bros. is a must-stop." The idea of Primanti Bros. as a "must-stop" is evident in the 24-hour original location. At any given time, you can find city residents and visitors alike saddled up to the bar ready to indulge, like Jim Stange and his daughter Lesley on one Sunday afternoon. Jim has lived in the area since 1979, and has been coming to Primanti’s for sardine sandwiches since the '80s. "It is a hometown thing," says Jim. "People have tried to copy it, but it is not the same." Lesley agrees. She lives in New York City now, but a giant sandwich is always in the cards on visits home. "There isn’t anything like it in New York," she says. And New York is supposed to have everything. This singular sandwich brings patrons back, time and again. While ownership has changed hands several times in the 80-plus years, the menu has, for the most part, stayed exactly the same. As Smith says, "It's the Holy Grail -- why mess with it?" Offerings include classics like jumbo baloney and cheese, capicola and cheese, and pastrami and cheese. You can always double the meat and add on eggs and onions, if basic pile-ons aren’t enough. “The ingredients taste great apart, but it is an amazing combination when you put them together,” says Mark Yester, a born-and-raised Pittsburgher. Mark, along with his wife Mary, brought a large group from Baltimore to try it out. Everyone seemed to enjoy the stacked sammies, and why wouldn't they? As Mary says, "All the food groups are here!" Primanti Bros. isn’t the only game in town that knows how to stack toppings-upon-toppings between two slices of bread. Other spots are in on the action of getting as many food groups in one hand-held combo with their own outrageous pairings. Since 1992, Fat Heads Saloon in the South Side has been an outpost for a solid oversized sandwich. Owner Glen Benigni used a bun from Sabroni’s, a local bakery, as the muse for the restaurant’s signature Headwiches. Benigni started playing around with toppings, everything from sunny side up eggs to house-made bacon to broccoli rabe to meatloaf, with interesting results. The city’s other favorite food, the pierogi, even gets its due in the South Side Slopes 12, voted the 5th best sandwich in America by Maxim in 2004. Charred kielbasa, sautéed pierogis and onions, American cheese, and horseradish sauce... is your mouth watering, too? Each Headwich is named after neighborhoods, family members, friends, and even loyal customers. None of the combinations is for the weak of stomach. "Our customers treat the Headwiches like treats," says Benigni. "We are the spot for people to go when they want that special sandwich." Just down the street from Fat Heads sits another sandwich great, Carson Street Deli. 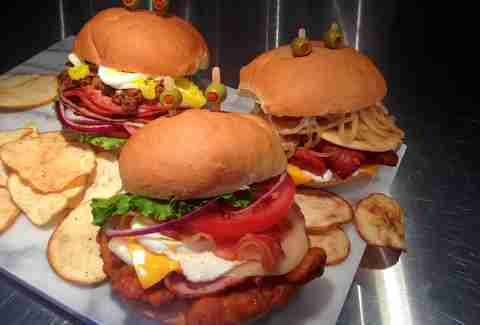 Some of the menu is simple, like a BLT or beef and cheese, but some of the menu goes big. My fellow partner in food, Mandy McFadden of eatPGH, introduced me to the wonder of the Donnie Brasco -- Buffalo chicken, cheese, lettuce, tomato, onions, hot pepper rings, and egg salad. It’s like clearing out the cupboards into a bun. "The higher the mountain of ingredients, the better," says Mandy. "I like the sandwich to challenge me." Sure, large sandwiches with everything imaginable on top are not the easiest to eat, but Pittsburghers love a challenge. With our storied steel town past and blue collar toughness, we appreciate tough work, tackling daunting tasks, especially those involving food. We are no longer the smokey city of old, though, and a new breed of food-conscious folk has flooded our streets. In the past five or so years, we have welcomed an influx of culinary sophistication with new and experimental restaurants opening almost weekly. Pittsburgh may be changing rapidly, but we can’t help but go back to our roots every once and awhile. When sandwiches are part of your story, you just have to own it. 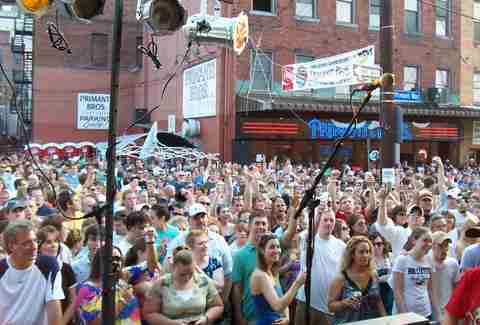 Sign up here for our daily Pittsburgh email and be the first to get all the food/drink/fun in the Steel City. Laura Zorch’s perfect sandwich would include two donuts instead of two pieces of bread. The insides won’t matter. 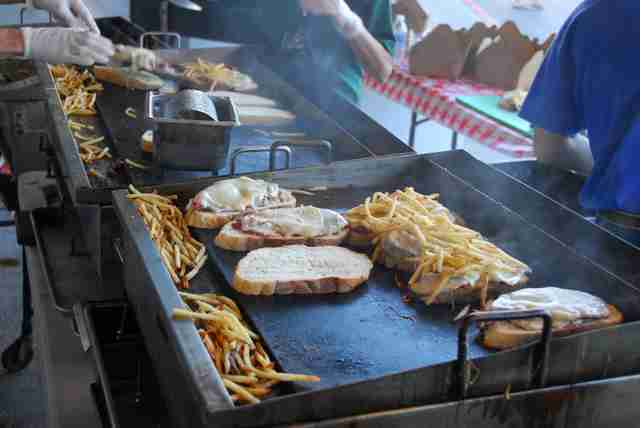 Check out some of her good eats at @eatpgh.